In 1974, Ohio State tailback Archie Griffin became just the fifth junior ever to win the Heisman Trophy. In 1975, Griffin became the first player ever to win a second Heisman. Twenty-eight years later he is still the only player to have two of the coveted bronze statues, which go annually to the nation's top college football player. 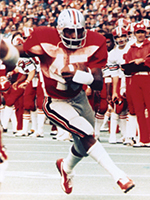 Griffin was the Buckeyes' starting tailback for four years, leading Ohio State to a 40-5-1 record and four Big Ten titles between 1972 and 1975. He started in four-consecutive Rose Bowls, the only player ever to do so, and was a three-time first-team All-American. In addition to two Heisman Trophies, Griffin also has a pair of Silver Footballs. The latter award is presented annually by the Chicago Tribune to the Big Ten's MVP. He is one of just three players to win that award twice. Griffin also was a two-time pick as National Player of the Year by both United Press International and the Walter Camp Foundation. He won those honors as a junior and senior. Following his senior year, Griffin, who graduated a quarter early with a degree in industrial relations, received the NCAA's prestigious Top Five Award for combined excellence in athletics, academics and leadership. It is the highest award the NCAA can bestow. His jersey number "45" was retired Oct. 30, 1999.